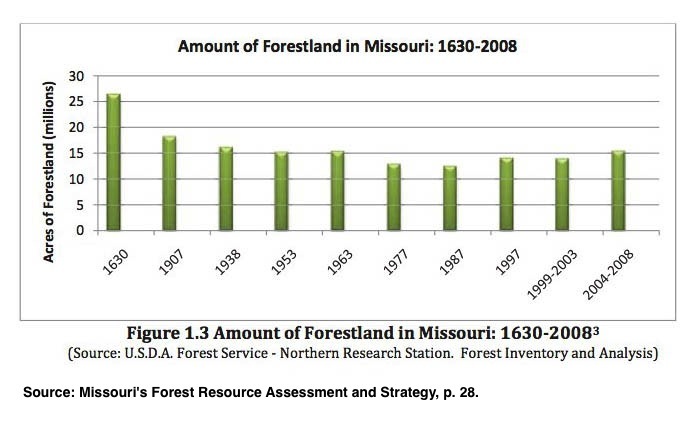 How much forestland does Missouri have? The Missouri Forest Resource Assessment estimates that Missouri has about 15.4 million acres of forestland. If it were all one contiguous block, that would be a square about 155 miles on a side. However, as the previous post reports, Missouri’s forestland is fragmented. About 82% of it is privately owned. The chart at right shows the acres of forestland in Missouri from 1630 through 2008. It shows that by 1987 about half of Missouri forest land was converted to other uses, after which the amount began to rebound. The Missouri Forest Resource Assessment describes a situation where high quality forestland continues to be lost each year, offset by newly forested acres. Thus, Missouri’s Forest Resource Assessment and Strategy describes Missouri as blessed with very large amounts of forest. However, as my previous post showed, it is highly fragmented, and increasingly consists of scrub species. 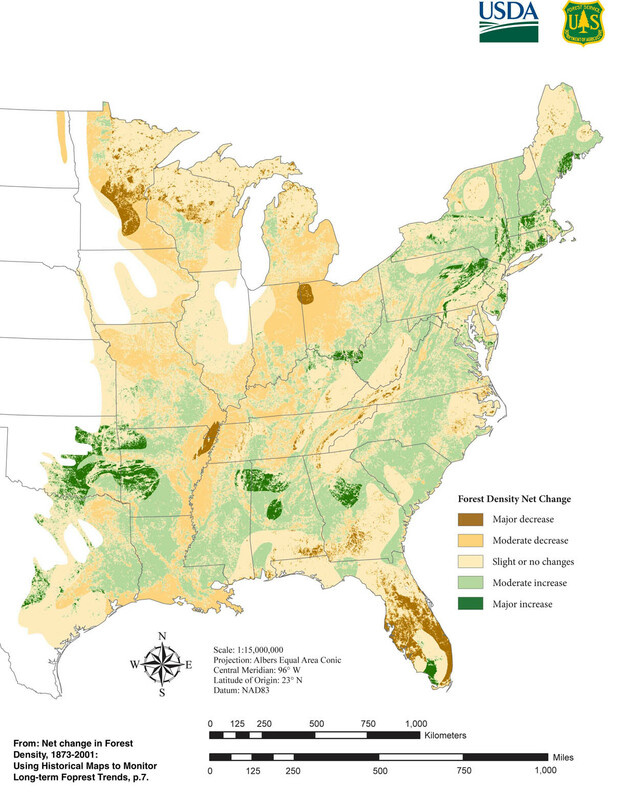 The map at right shows where between 1873 and 2001 the Eastern United States has lost and gained forestland. In Missouri the major losses have occurred in the southeastern corner, and in a wide swath across Northern Missouri. Liknes, Greg, Nelson, Mark, and Kaisershot, Daniel, Net Change in Forest Density, 1873-2001: Using Historical Maps to Monitor Long-term Forest Trends, Newton Square, PA:U.S. Forest Service, downloaded from http://www.nrs.fs.fed.us/pubs/43744. By mogreenstats in Land on 2014/03/06 .